In October of 2010, I traveled to Harper's Ferry National Historical Park to learn about J. E. B. Stuart's involvement in one of the earliest incidents on the Eve of the Civil War. This is where abolitionist John Brown and several followers seized the United States Armory and Arsenal at Harpers Ferry on October 16, 1859. This trip was another effort on my part to learn more about this famous Patrick County native (and my hero). My idea was to go to the Civil War historical sites and obtain first hand information. On this same trip I also toured the battlefield at Antietam, Maryland, and the historic towns of Shepherdstown and Charles Town, WV. Now here is the story. Col. Robert E. Lee led 90 Marines to Harper's Ferry under orders from President James Buchanan to recapture the Armory from John Brown and his men. Stuart was in Washington with War Department negotiating the sale of a sabre attachment which he had obtained a patent for. 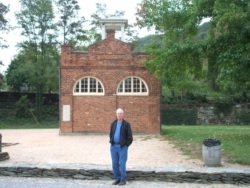 While in Washington, the news was received about the "John Brown Raid" at Harper's Ferry. Stuart was requested to convey to Col. Lee in Arlington a secret communication that he had been selected to command the marines to suppress the insurrection. Lt. J. E. B. Stuart sensing the excitement of the matter asked permission to accompany Col. Lee to Harper's Ferry. Stuart served as Lee's aide throughout the incident and tried unsuccessfully to negotiate a peaceful settlement with the raiders. Col. Lee wrote a letter asking Brown to surrender, and gave it to Lt. Stuart to deliver to the engine house. When Stuart approached the engine house, Brown opened the door just a crack and this allowed Stuart to see who it was. Lt. Stuart recognized it was old "Osawatomie Brown", whom he had encountered in Kansas Territory in 1855. Stuart read the surrender request from Col. Lee. Brown had a cocked rifle in his hand. Brown refused to surrender. Stuart stepped back from the door and waved his hat, which was a pre-arranged signal for the Marines to attack. Newspapers wrote accounts and gave Stuart credit of having led the attack upon the engine house which John Brown had taken refuge, but Stuart was careful to disclaim such. In writing to his mother from Fort Riley in January of 1860, Stuart said, "Colonel Lee was sent to command the forces at Harper's Ferry. I volunteered as his aid. I had no command whatsoever." Stuart was credited with his bravery in approaching Brown and his men. After the incident, Brown bragged that he could have wiped Stuart out like a mosquito. Stuart got Brown's Bowie knife and kept it for himself. Later in the day after Brown's capture, Col. Lee requested that Stuart take a few marines over to John Brown's house about 4 Â½ miles away to see what was there. There he found some pikes, blankets, clothing and utensils of all sorts. He was only able to carry off the pikes, since he only had one wagon. John Brown was tried and convicted of treason, conspiracy and murder. 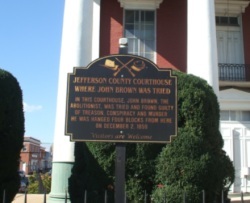 He was hanged in Charles Town on December 2, 1859. 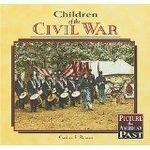 This pre-Civil war experience with Lt. J. E. B. Stuart under the command of Col. Robert E. Lee, was just a precursory of what happened later in the war when Stuart was the eyes and ears of Lee. Harper's Ferry is a very scenic and historic town on the banks of the conjuncture of the Potomac and Shenandoah Rivers and a great place to experience what life was like 150 years ago, leading up to the beginning of the American Civil War.